Built with stability in mind and little else, the Walk N Work still suffers from flaws inherent to desks paired with running treadmills. It poses both an inconvenience and a safety hazard to users, and its incompatibility with desking peripherals makes it an ergonomic dud. We caution deskers against the Walk N Work and its ilk, and encourage them to use dedicated walking workstations. Not for use with ergonomic peripherals. Impedes access to treadmill console. 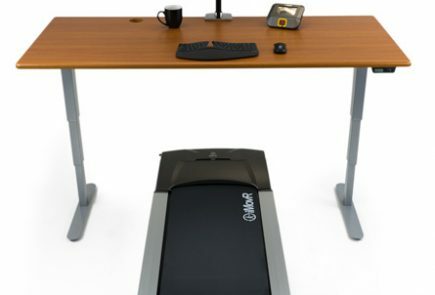 The Walk N Work is an ill-fated attempt to convert a running treadmill to a treadmill desk. While it's certainly more stable than other similar offerings, it still creates a workspace that is unergonomic, unstable, and unsafe. 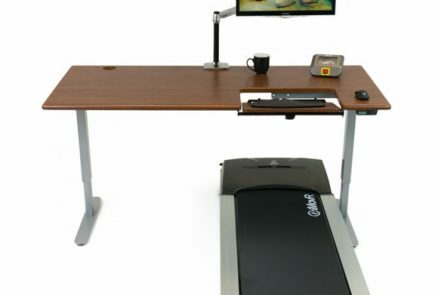 Every once in a while, we at the WorkWhileWalking labs encounter products that remind us just how uncommon it is to find an acceptable walking workstation. The treadmill desk industry is saturated with kluges that try to grab a piece of the rising trend without a clear understanding of user safety and ergonomics. Among them is the Walk N Work, a product with great intentions and poor execution. The Walk N Work, which looks like a fusion between a bar stool and a sawhorse, is the latest on our list of shoddy workarounds meant to convert running treadmills to walking desks. We’ve already explained why a running treadmill is never a good substitute for a dedicated walking treadmill, but we nevertheless keep finding these platforms that sit between the walker and the treadmill console. We say “desk” because of the myriad problems inherent in the Walk N Work – and all similar hack treadmill desks. For starters, the fact that this thing sits in front of the treadmill console already impedes its usability as a treadmill desk. 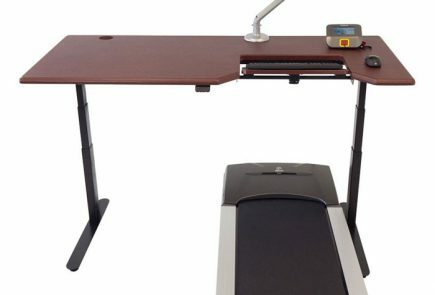 Pictures on the Walk N Work website do show the desk paired with a repurposed running treadmill, but anyone who decides to walk on one of these should be aware of how their treadmill’s side rails may obstruct the desk. Add to that the space separating the user from the treadmill console and you’ve got yourself a recipe for frustration, or worse. The Walk N Work is not only inconvenient, it’s downright unsafe. The distance you have to reach for the console means that you’re less able to quickly adjust the speed of the treadmill or to stop it without using an emergency stop plug. Additionally, the Walk N Work takes up a significant amount of space on the treadmill. Judging by the product website’s pictures, you lose half the walking space of the belt and risk falling off the back. Your natural response will be to walk as far forward as you can, in which case you risk slamming your shin into that crossbar. In an effort to retain as much space as possible, the Walk N Work was made extremely slim. While the website does not offer specific dimensions for the table’s depth, photos indicate that there is barely enough table depth to accommodate a laptop. You can forget about the monitor arms and keyboard trays that make a good ergonomic work station. Your neck, wrists and arms are in for a rough time on the Walk N Work. Even if paired with a walking treadmill, this desk’s inability to accommodate ergonomic peripherals makes it impossible to recommend. The Walk N Work does not currently have pricing or shipping published, and does not look like it’s available on the market yet. Nevertheless, the Walk N Work gets a resounding pass from our experts. You’re better off finding a dedicated treadmill desk for your workspace. So I’ve rigged up a monitor on a pole behind my treadmill, but finding a stable platform for the keyboard has been a challenge. If you have monitors mounted separately, would this work better? We do recommend full treadmill desks for an ergonomically sound workstation. And if you are looking for a keyboard tray, check out our blog on Selecting The Right Ergonomic Keyboard and Adjustable Keyboard Tray.